Today has been a day of rest and recuperation. 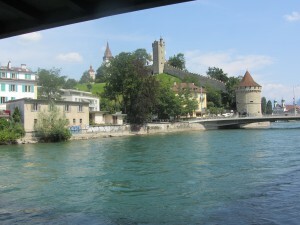 We have lazed about shamelessly and have enjoyed the experience We have strolled about Basel a bit and now have a reasonable idea of its layout. A city with a stonking great river running through the place helps quite bit with geography. Tomorrow we must collect together the bits and pieces we shall need for the rest of July, maps, timetables, accommodation lists and a sharpening stone for my knife. My trusty blade has coped with all sorts of stuff over the last three months and now it needs sharpening. From our bedroom window I can see a knife shop, so an early visit is in order I think to return my Swiss army knife to Switzerland. It is an oddity that each country in Europe appears to have developed its own type of electrical socket. I have never expected the mighty British three pin plug, capable of carrying the power of an industrial arc welder, to fit its more refined continental cousins but the plugs we have for Italy seem able to coexist quite comfortably together with the sockets of France. It is here in Switzerland that things seem to have gone awry. The sockets look as though they could accommodate a French or Italian plug, but they won’t, no chance! So tomorrow we must find something to remedy this unfortunate state of affairs. We are frantically relearning our German and some of it is beginning to surface again, let’s hope that it comes back quickly. 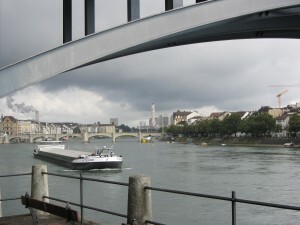 I won’t include a description, and pictures, of our wanderings about Basel in the guise of tourists today, only the stuff from the perspective of the long distance stroller. Stuff about Basel can be found all over the internet http://www.basel.com/en is a good place to start though. As the French days and weeks went by we felt increasingly at home in France. Now we are starting the process of learning to be Swiss.We have bought chocolate, cheese and Janet has looked at some watches. Swiss German is a puzzle to those of us who have attempted to learn hochdeutsch, but we will make sense of it I’m sure, just as we are about to leave probably. This morning we set out to find a shop where I could replace my worn out trainers. I had tried to get a new pair in France but my feet were too big for French shops,. I mean that French shops could not supply shoes in size 12 not that the doors were too narrow to allow entry. I hoped that Swiss feet might be larger than those found on the end of French legs, making the chance of getting a pair in my size in Switzerland more likely. The first shop was a dud but I had success in the second. The old pair, purchased in Charlie’s Stores Welshpool, are now languishing in a Basel skip. 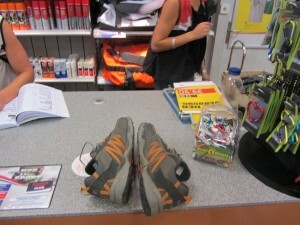 With me proudly sporting my brand new pair of walking shoes we tried to get hold of some maps. A large book shop invited us in but was found to be wanting. Feeling a little down at this early failure we went to the tourist office just in case the officials there could help. As usual we were not really paying attention and wandered around the old town for a bit before we found the famous “i” sign. Although the tourist officer was keen to be helpful and was able to chat to us in English, we left empty handed and none the wiser. Our tourist officer did advise us to visit Thalia where he thought that maps might be found. If you need anything British when you are in Basel then Thalia is the place for you, digestive biscuits, books and all that sort of stuff. In addition to all that nonsense Thalia has an incredibly knowledgeable map person. We think that we have bought a good strolling map. The map has trails marked in red and roads in lighter colours, it looks a bit like the long distance walking map we had for the UK, but at 1:60000. My trusty Swiss Army knife struggled to cut yesterday’s salami even though the salami had softened in the hot sun. From our hotel window there is the Messer Centre. 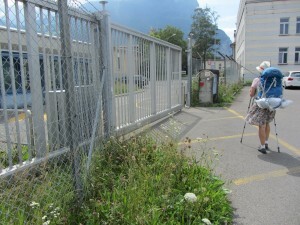 I went in to the Messer Centre and became really aware of the difference between the UK and Switzerland. There were knives everywhere. There were folding knives of all types but also massive great cleavers of all sorts hanging everywhere. My tepid request for a knife sharpener seemed timid in such a forbidding environment particularly as there were some heavy looking individuals idling outside. 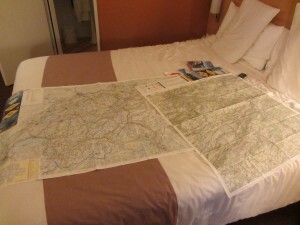 Having had a good look at our new maps we have nearly worked out how we shall stroll to Luzern. It looks as though we might be able to get to Luzern in 4 days, via the footpaths, as the terrain appears to be quite friendly. We can’t see anything above 560 metres in the way so, with a bit of luck, there won’t be too much up diddly up up and down diddly um down. Another day off tomorrow and then we will be off to Luzerne. 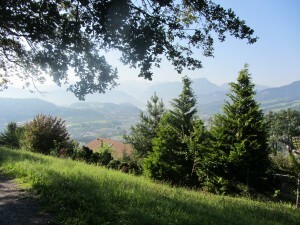 Today is the last lazy day before we head out towards Luzern. I may have already mentioned the difficulties finding British/French to Swiss electrical plugs and today proved to be as fruitless as yesterday. We were advised to visit a particular sell everything shop as this would be where they could be found. As we strolled towards this emporium we stumbled upon the amazing Tinguely Fountain which is in constant motion and would gladden the heart of any Heath Robinson enthusiast. I have added a rather crude video to see if I can get videos to work. Unfortunately, the cement lorry blowing concrete into some new foundations rather spoiled the air of calm contemplation aroused by the fountain. If you watch the video it might be a good idea to turn the sound down. I could have watched this thing for hours really but business called. We got to the shop and went the electrical department. Our German was up to asking for an adaptor but the device shown was a huge great thing that must have weighed half a kilo and cost an arm and a leg. With this device one could connect anything to anything, with variable voltage switches. All I wanted was a simple device, light and simple. I asked for a plug so that I could adapt our stuff to fit into Swiss tidiness, no luck. I shall have to look for a builders’ merchant tomorrow as we stroll. 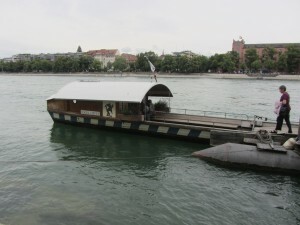 The ferry, in which we crossed the Rhine, is a fascinatingly simple device. 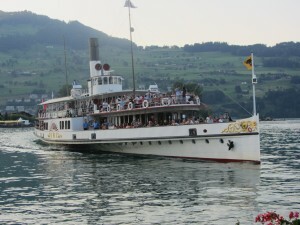 The ferry is tethered to a line, crossing from side to side over the river, by means of a sliding rope. The force of the river pressing against the rudder causing the ferry to cross using no power. 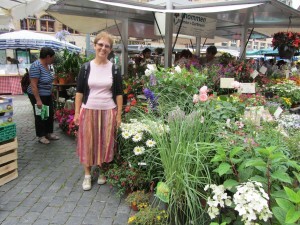 The market place was filled with flowers today. After lunch we had the final planning meeting. We have put yellow marker spots on the map where we need to change paths, so that should do it. We shall see if this scale and type of map is any good tomorrow. Today we bought our Swiss Half Price Passes which will entitle us to half price fares on all Swiss trains, funicular railways, cable cars and the Glacier Express. 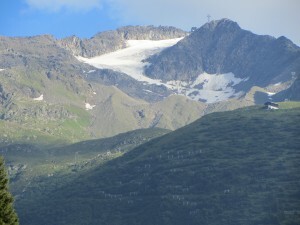 A couple of years ago we saw a programme on TV about a bloke who had strolled more or less where we are going and he went for a trip on the Glacier Express from Zermatt to St Moritz. Having looked up the prices for this thing our Half Price Passes should pay for themselves with one trip. The sky looked rather threatening as we set out this morning. In fact the sky dropped a dollop or two of water onto our unprotected heads as we strolled past some impressive banking premises. We pretended that nothing was happening and chuckled at this feeble attempt at putting us off our intention of going for a stroll. 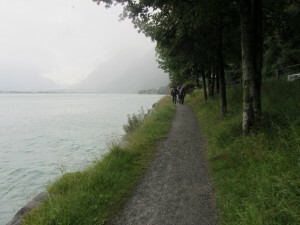 After a minute or two it looked as though rainwear was once more the order of the day so we struggled into our coats and pressed on towards the Rhine and our path. We wondered how we would manage with our new map, hoping that it would have enough detail for our needs. We have become accustomed to a 1:25000 scale and now we were to be using a 1:60000 so this was another potential source of banana skins. 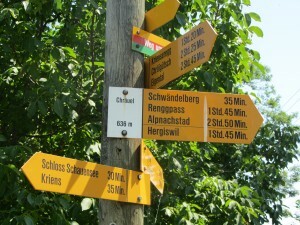 In theory the start of the stroll should have been easy as it followed the Rhine for a few miles. The Rhine is not easy to miss so we thought we would get the hang of things before needing to be clever. Initially our stroll took us along a long boulevard and under some trees. It was under the trees that the rain really decided to show us what it could do if it tried. We saw a bloke just in swimming trunks walking along and disappearing into a house. I don’t know if he had been for a swim or was making a statement against the weather. 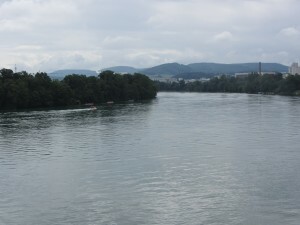 The river side became more and more industrial as we left the pretty bits of Basel behind. 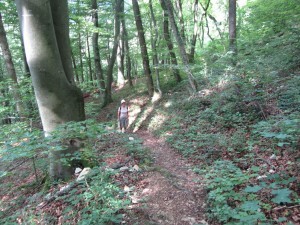 The footpaths, wanderwegs, are really well marked and we had no difficulty following them. We both agreed that today was the best way marking we have seen since we had strolled down Offa’s Dyke to Knighton. The only blemish on this otherwise perfect score was around the industrial area. We found ourselves way off beam and without satnav would have been in a pickle. The change of direction was marked and pointed over a narrow railway bridge, but in a place which was not clearly visible from the path at that point. 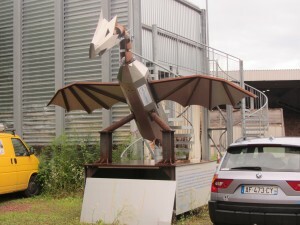 If we hadn’t made the mistake then we would have missed seeing the huge and fabulous metal sculpture outside a welding factory, so we weren’t really fed up. 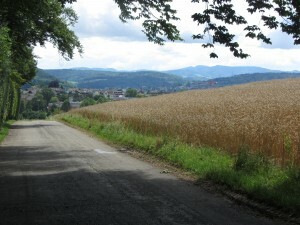 The Rhine continues on with a few hills to prepare us for what is to come. More hills, this time we are a bit higher. We have been strolling on the flat for a long time now and it took us a few miles to get used to going up and down. More up tiddly up up. As we approached Altmark the map showed us, very clearly, that we needed to stay on a particular side of the railway line but the waymarks told us to go over the railway line. Instead of following the waymarkings, reading the map or looking at the satnav we steadfastly stayed on the ‘correct’ side of the railway line. After about fifteen minutes of this I smelled a distinct odour of fish. My satnav suggested that we were in a field and leaving the railway line at right angles and at a great speed. We were in a new housing estate which explained the empty field bit but not the right angles to the railway line bit. 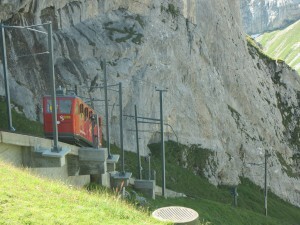 We have noticed that trams are a popular means of mass transport here in Switzerland. We hadn’t realised that trams go out of town and into the countryside. 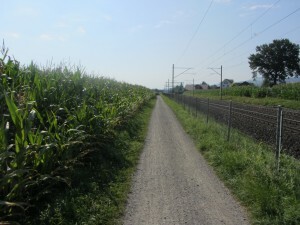 We had been following a perishing tram line not the railway line. About turn and a smartish retreat to our original position was the only option. We resolved to follow the signs from now on, no matter how outlandish they appear to be, well at least until the next time anyway. Finally, Sissach was in our sights. No more up for today. We had measured the day’s stroll to about 15 miles. In the end I think that it was about 19 miles but it really was fabulous to be in the hills again. It looks as though the stroll to Luzern won’t be too high and it will prepare us for the Luzern to Lugano section, which will be high. Perhaps some sort of predator? 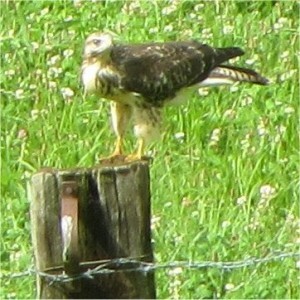 On the way into Sissach we spotted a bird on a fence post. It looked like some sort of predatory bird although it seemed fairly relaxed on its perch. Before we set out this morning I wondered if we would rise above the 3,000 ft marker. There was a place on the map which, had we gone that way, would have done the trick. Perfect strolling weather today, a little sun, a light breeze and a few clouds overhead. 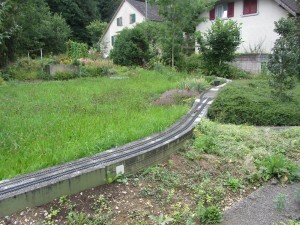 We passed a garden in which some lucky person had established an ‘o’ gauge train set. I’ve always fancied an open air train set but have never had the gall to spend that sort of money on one. 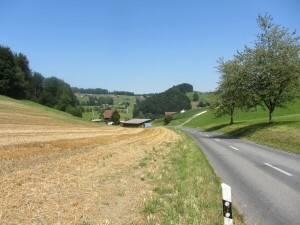 Leaving Sissach we found ourselves climbing steeply up to the top of the first of several hills. 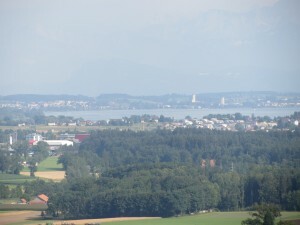 Our days of soft canal strolls are now firmly in the distant past as we look towards Luzern and beyond. At one point today we stood on a view point with a panorama diagram in front of us which told us where Jungfrau and Eiger were to be seen. I am glad that Switzerland has been gentle with us thus far and is preparing us for what is to come sensibly. I decided to wear a T Shirt and sleeveless vest today as it looked as though it might be hot. As we climbed up the first hill I removed my T shirt and tied it to my rucksack to air. As a result of removing the T shirt and wearing only a sleeveless vest I felt cool and carefree for quite a long time. After a while Janet told me that I was turning very pink at the top of my arms. I looked for the T shirt in order to put it back on but it had gone. The sun became hotter and hotter and we were walking in a south easterly direction so one shoulder was always exposed to the sun. If each shoulder could have had a go in the shade things might have been OK but In the end I had no option but to put on my pullover as a protector. It is no joke wearing a wool pullover in the sun. 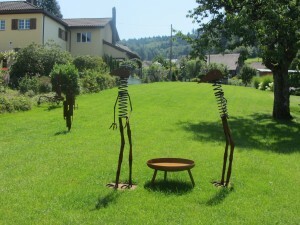 People strolling in Switzerland are treated to quite a few delightful picnic areas with barbecues, tables and chairs. The pattern of today seems to have been a fairly stiff ascent followed by a stroll through a fabulous alpine meadow or finding a stunning view of a valley with hills beyond. 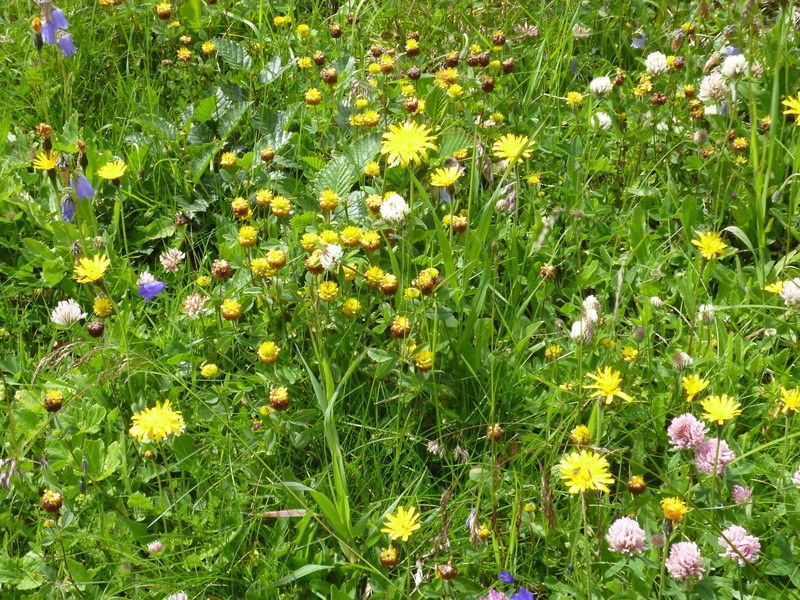 Then, as we descend from our newly found alpine meadow or view of distant hills we have the pleasure of anticipation knowing that in a shortish time we will be repeating the experience once again. 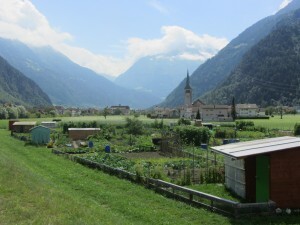 I am still surprised that farms are in the middle of villages both here and in France. We saw a large dairy farm today right in the village centre, advertising milk sales 24 hrs everyday from a cooler at the road side. 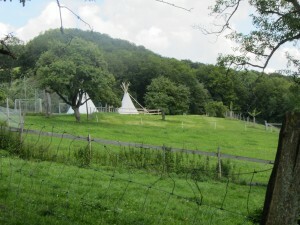 As we toil up steep hills, over grassy meadows and through woods it is always a surprise when we arrive at a picnic place and hear the happy sounds of children playing or adults drinking and eating their lunches having driven there in a car. 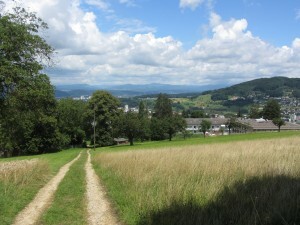 Arriving in Olten we have moved a few miles nearer to the bigger hills we can enjoy later on. We didn’t get to 3,000 ft today, but we weren’t far away. Before settling down to write this stuff I poured myself a cold beer as a refreshment after 12 or so hours in the hot sun. I managed to pour some of the stuff into my trainers so that will increase the interest flies have for me tomorrow. After a day of inaction yesterday it felt great to be on the stroll once again. The weather forecast suggested that there could be rain in the afternoon but the morning was glorious. We have seen delightful covered wooden footbridges over the rivers here. The ‘no smoking’ signs give one a lot of confidence when using these old structures. The first task this morning was to find the start of the footpath. In general the markings are very good. They are also clear and frequent. This morning though we struggled to find the path we needed and wandered about quite a lot before we found it. Our breakfast was beginning to lose its effect and we were still roaming around peering at our map and hoping for the best when we saw an Italian wine shop. A bit early for a snorter you might think but we actually wanted an ice cream each. When we went in we were greeted in Italian, it was like being at home. We left the shop clutching our ice creams and feeling much more relaxed. After a few false starts we knew that we were on the right track as it went straight up the side of a hill and into a forest. 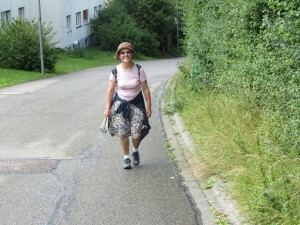 People we see on the paths are very friendly, but always in Swiss German of which we know only two words. On the first path of the day an elderly gentleman was feeding a deer bearing a huge set of antlers and this gentleman had a chat, but in Swiss German. He then zoomed off up the path into the distance. He didn’t look particularly fit but had a good turn of speed uphill. I think that one could navigate on the paths without a map or compass if very vigilant. The errors of navigation we have made are usually caused by lack of attention or being diverted by chat. 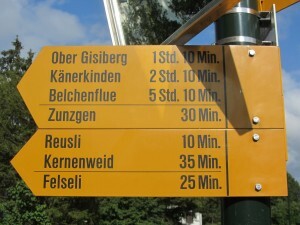 The signs are detailed and give distances in time so there is no excuse for errors, particularly as there are yellow diamond shaped markers painted on trees and rocks at regular intervals. Metal sculture seems to be quite popular here. 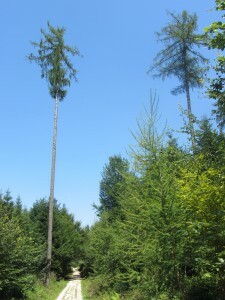 As we strolled through the woods today we passed some incredibly tall trees all of which appeared to be devoid of lower branches, they looked quite imposing in an odd sort of way. Much of today’s stroll has been within the shelter of woods. We have not had the sudden emergence into alpine meadows or had stunning panoramas opening out before us today but the shade was wonderful. We drank gallons of water today and were very grateful for the regular appearance of delicious cold mountain water. In order to get a good start this morning we set our alarm clocks to trill at 6:30 am (5:30 am GB). Neither of us heard the alarms go off because a gully emptying lorry was hard at work emptying gullies outside our bedroom window. The window was left wide open in order to let in a tepid stream of air to lull us to a swift and dreamless sleep and so we were treated to the full majesty of this fine machine. So although we didn’t hear the alarms, we did get up at the right time. Making our way out of Sursee the sun was already beginning to feel hot. 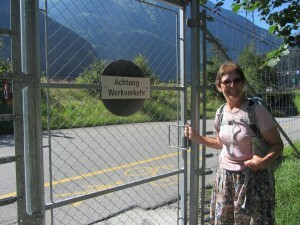 We fell into our new Swiss routine of looking for the yellow wanderweg markers and set off towards Luzern. 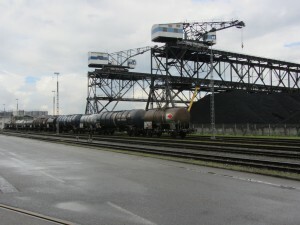 The first section of the stroll took us past industrial sites and ran adjacent to the railway line. 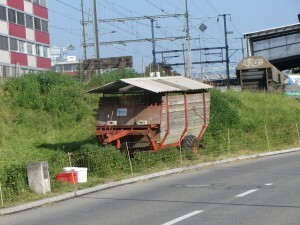 We were very surprised to see sheep grazing on the steep railway embankment in the industrial landscape. No grazing opportunities appear to be missed here. 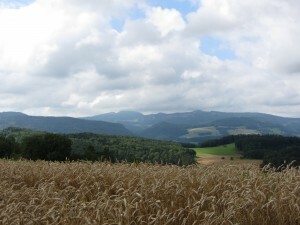 In the hills the smallest patches are cultivated and hay is made on incredibly steep paddocks. We knew that if the sun shone today we would be baked as the map revealed very few shady trees. The sun did shine brightly and the map was quite correct in its prediction of open country. 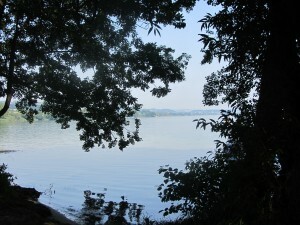 Sursee lies at one end of Sempachersee which looks delightful with families having grassy lakeside areas with little huts in which to enjoy the water. We see quite a lot of this house building style. They look as though they will roll over at any time. I must find out why some of the traditional houses are built with small bottoms and large tops. They look as though they might topple over at any moment. The sun continued to get hotter and we began to flake a little. The path was mostly flat but it seemed like very hard work as the day wore on. Finding a seat under a tree seemed almost miraculous. 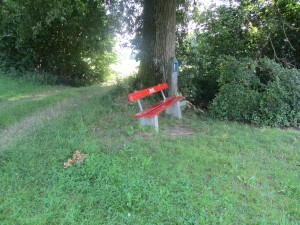 We sat on this wonderful shady seat, removed our shoes and thought that we had found our hearts desire. 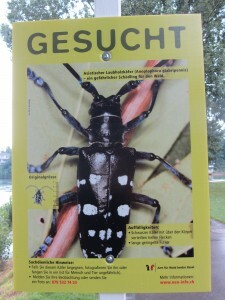 As Luzern was rawing nearer and nearer we couldn’t really believe our luck. A wonderful, shady dell appeared and the path went into it, not around it. 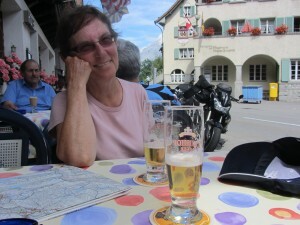 I asked Janet if she wanted to go to the tourist office to see about getting some maps. I knew that she must be exhausted as she wasn’t interested at all. Once in the hotel we just flaked out and slept for over an hour.After this restorative nap Janet was able to go map shopping once again. 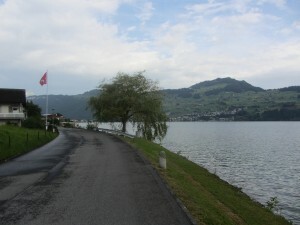 We are still not sure of tomorrow’s stroll but it will probably take us along the south side of the lake. How far we get is anyone’s guess. Despite a lateish night last night we set the alarms for 6:30 am again this morning. Our slumbers were undisturbed and we arose refreshed. 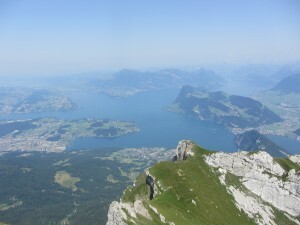 The lake at Luzern needed to be overcome in some way, north or south. The route to the north is quite long and involved. The route to the south is shorter and more interesting. So this morning we set off in a southerly direction towards Buochs in the sun. We ate no breakfast but bought some croissants on our way. 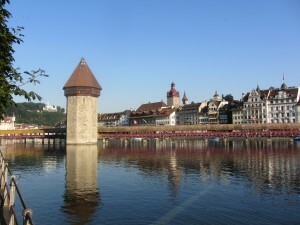 Luzern was looking magnificent and the many cyclists and pedestrians give a really vibrant feeling. Pedestrians and cyclists are obviously very welcome in Luzern. Getting out of Luzern was quite easy. The footpath signs began quite near to the town centre and were very frequent. 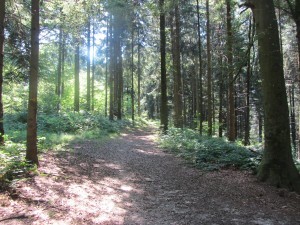 The early start meant that , although the sun was warm, walking was very pleasant. 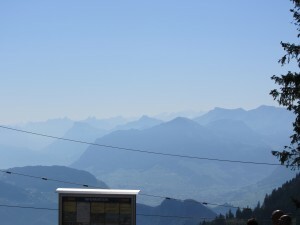 The views of Luzern and its lake were slightly obscured by haze but not enough to spoil our enjoyment. 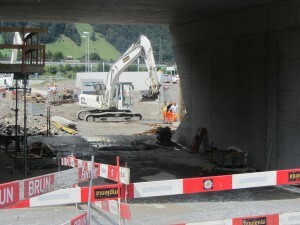 We did a big loop around Luzern in order to avoid the noise of rush hour but retuned to a suburb so that we could cross the valley and go up the other side. We went slightly astray here as the path was closed due to road works. 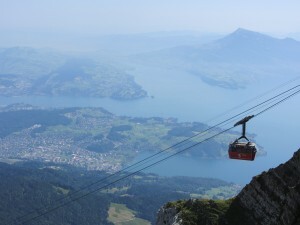 By going astray we passed the start of the cable car which goes up to the top of Mount Pilatus. 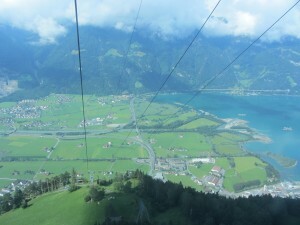 We thought about the need to get to Buochs and all that practical stuff for about a minute and went for the cable car ride. The steps in the picture actually go to a church but this is where the path to the cable car goes until the works are completed. The initial ride is in two sections by means of little gondolas for four people. We shared our gondola with a local lady who was going for a stroll. Having just enough German for a chat passed the time very nicely as we looked at the toboggan runs and other stuff laid out for us to see below. We arrived at, what we thought was the top and had a look around before deciding to return to continue strolling. At that moment a bloke turned and looked upwards and we could see two large cable cars going up and up and up, from below it looked like the cars were climbing a vertical face. This looked to good to miss and this last bit was a terrific ride as it passed over narrow a ridge with a huge drop and a view of a chapel perched on the side. 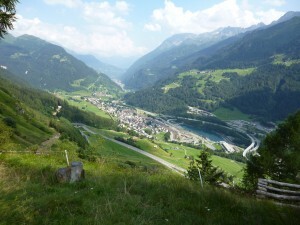 At the top we found a stunning view an hotel, bars and some chaps playing alpen horns dressed in traditional costume. 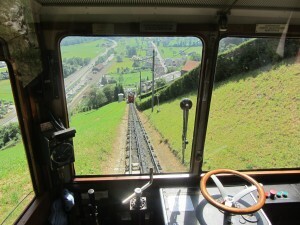 We also spotted the steepest rack and pinion railway in the world, paradise. From above the cable car journey didn’t look quite so steep although an Australian bloke asked me if we had to make the return journey. We were dressed in just tee shirts, shorts or skirt and it felt very warm. I tried to imagine how warm it would be at the top of a 7,000 ft mountain in the UK, even in July. 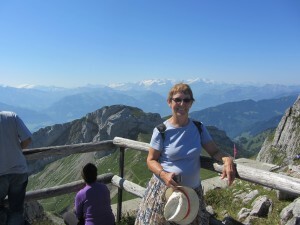 After a fabulous few hours, including a short climb up to one of the peaks, we had to return to earth in order to carry on strolling to Buochs. 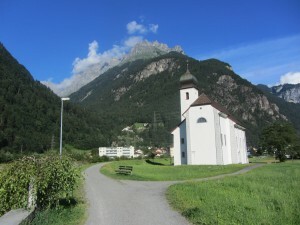 The stroll was much as before, lovely scenery, plants and on one occasion we passed a couple practising duets on the alpen horn. The sound of the horns carried for miles, as it is supposed to do, and sounded wonderfully warm and mellow. Which way do we go now? 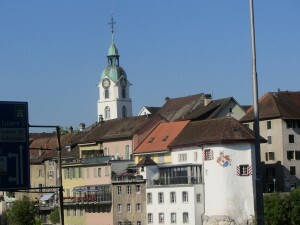 We knew that we would arrive in Buochs at a later time than we had planned but hoped that we would be able to get some accommodation organised. 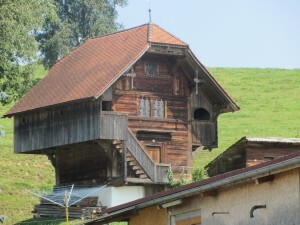 We didn’t need the accommodation for that night as we intended to return to Luzern. We arrived at the bottom of a hill with steps leading upwards to a sharp bend, then to another bend, then to another, then to, then ………….. When we got to the top we agreed that it was the longest continuous up tiddly up up we had ever encountered. We were very glad that there was no one about at the top and that we were in a wood as we needed desperately to cool off. 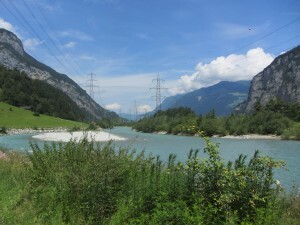 As we approached Buochs the valley is quite narrow and holds a river, a footpath, a cycleway, an ordinary road and a motorway. 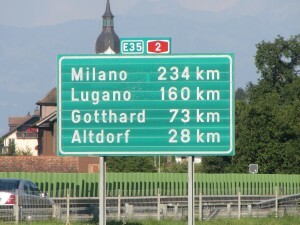 On the motorway signs we could see our next targets. It is sometimes very hard to believe that we have walked every step of the way and that we are well over halfway now to the end. The next, and last, boat back to Luzern was due at 8:25 pm so we ate a delicious supper at a lake side kiosk and sat and waited. The journey back to Luzern was a magical experience as the sun gradually started to set over the hills, only to return again as we rounded a massive mountain and turned west. 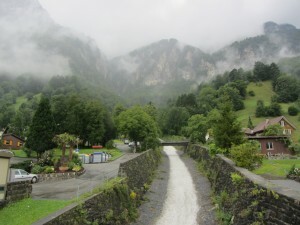 So instead of strolling on day 114 we shall take the train to the start of the steepest rack and pinion railway in the world and go up Mount Pilatus again and climb a few more pinnacles. The map looks a little odd today as I forgot to turn off the GPS in the cable car. 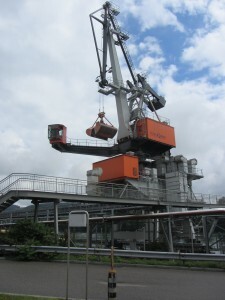 The distances include the straight up and down cableway. The day started quite badly from my point of view. I have never enjoyed buying clothes and get a headache when I have to be involved in this pursuit. This need for new clothing could have been avoided if the huge heavy boots I bought in Reims had not become a burden and needed to be sent on to a period of relaxation in Italy and, if I had not been reduced to one tee shirt due my own stupidity. The process of choosing the clothes was simplified for me quite a lot as there were only about 9 pairs of shoes in my size in the large department store in Luzern, all of which were displayed by the XXL notice. Janet drew my attention to some tee shirts, all reduced in price to 10 Swiss Francs. The only one of these which fitted me was orange so I bought it. Having to make all of these tricky decisions nearly floored me so I went to look at the bicycle display to calm me down. 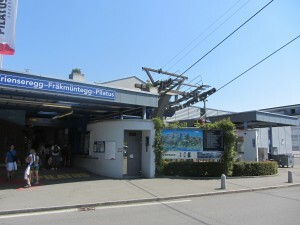 After this very poor start to the day we set off to the railway station at Luzern to get the train to Alpnachstad to get a cog wheel railway ride. The original cog wheel trains up Mount Pilatus were powered by steam which must have been exciting for the bloke chucking the coal on the fire as the engine was going up. 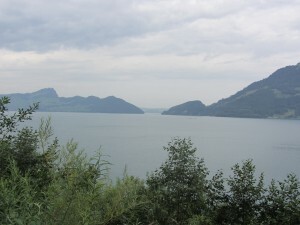 The track is built on a narrow wall which clings quite nicely to the side of the mountain giving terrific panoramic views of the rapidly shrinking lake and town as the train ascends. Having arrived at the top of the mountain we wandered about a bit doing this and that in a touristlike manner, climbing up things and strolling down a tunnel. The little paths to the various peaks at the top of the mountain were filled with little children running up and down apparently olivious to the massive drops below. It was quite refreshing to see parents giving their children a bit of space in which to have an adventure. 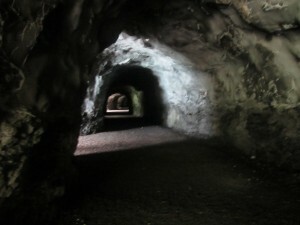 When we were wandering about in the tunnels we encountered an Australian family and passed the time of day etc. They are on a tour of Europe and had been in Sicily and had found it too hot. So, if they had found it too hot I think that it is a place to avoid for me, at least in summer. After all the excitement of the train ride and the mountain we were happy to sit in the shade at the bottom of the train ride. There was a trio playing traditional Swiss music on a species of three row melodion under the shade of an umbrella at the station. I had a chat to them but they didn’t give me a go, so I am still dealing with my accordion withdrawal problem. 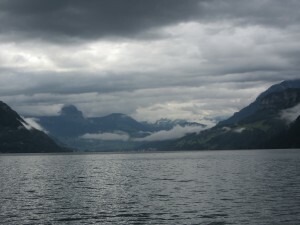 The boat ride back to Buochs really meant the end of the Luzern bit, which has been even better than we expected. 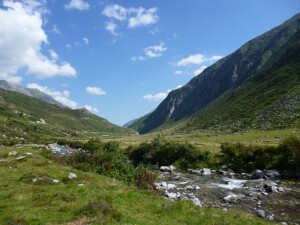 Tomorrow we stroll onwards again, to Fluelen about 20 miles. We have two possible routes, one of these possibilities has an ascent of 500 mtrs in less than 1Km. We may choose the other route. The weather forecast for today was not particularly promising, rain in the morning and thunder in the afternoon. We looked at the map and decided on a longish stroll which would take us to the end of the lake. The promised rain arrived but we couldn’t really decide about how long it would last so were in an out of our raincoats every twenty minutes or so. As we were strolling along, in the wind and rain, the weather and scenery reminded us very much of enjoyable strolls we have had in Scotland in summer, only warmer. At this point in the stroll we were making really good time and feeling incredibly pleased with ourselves. We turned off the yellow diamond marked routes and onto red and white marked routes and started to climb. We climbed and climbed and climbed. This up and up really made a dent in our average speed and started to throw an enormous spanner into our particular works. At the back of our collective mind was the inevitable down down down followed by another up up up and so on. We were still going along quite nicely but in a more stately manner. The path needed some care in places but, with sticks, posed no real threat of falling off in a undignified manner. 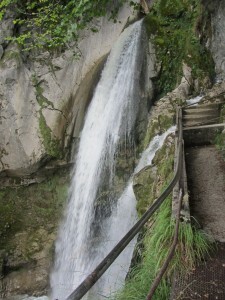 The huge amount of water and long drops gave us our first sight of a waterfall worth talking about. The path didn’t give us any real opportunity of making up lost times so we decided to head for Bauen instead of Fluelen our intended destination. 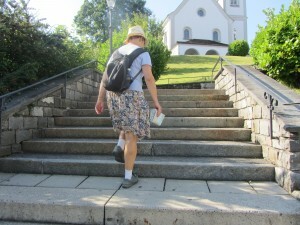 The path into Bauen took us down a long flight of beautifully made stone steps. Today’s stroll has taken us through some fabulous scenery on paths which must have taken many hours of heavy labour to make and to maintain, so whoever did it, thanks very much. At Bauen the sun came out and we ate our delicious packed lunch seated at the water’s edge. 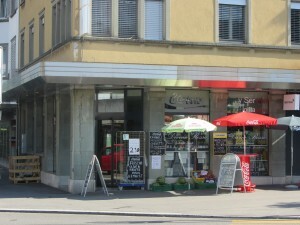 After a leisurely late lunch we sat on the terrace of a bar and ate an ice cream. 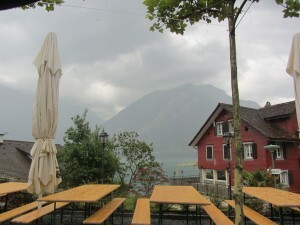 The thunder ad heavy rain started in earnest as we, plus some Swiss people, huddled under a small pergola. The pergola had the same peculiarity as that which I have observed in other pergolas, it developed a massive bulge which eventually dripped masses of water onto the bloke sitting under it. The bloke did what everyone does to remedy the situation and poked the bulge with his hand. The bulge did what all these bulges always do and made sure that most of the water went over the bloke doing the poking. 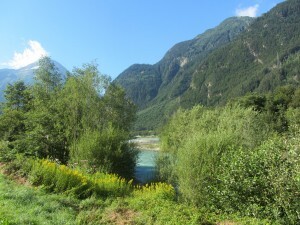 We didn’t finish the walk at Fluelen but, so what? We had a really good stroll. The weather forecast this morning was quite detailed but could be distilled down to the phrase ‘bucketing down all day’. Wet weather looks more interesting than does clear weather in a photograph but on balance fine weather is more enjoyable when out for a stroll. Very reluctantly we got into the wet weather stuff and, with a merry song on our lips, set off. Just like yesterday, the sun came out after about twenty minutes and the scene was transformed. As we strolled yesterday we had to tread very carefully as hundreds of little frogs, about as big as a thumbnail, were hopping across the footpath. The little blighters were at it again today, causing us to hop about as well. It looked as though we might as well just take off the wet weather stuff and then allow the sunny spells to dry us out. The volume of water pouring down from above was a clue to the quantity of water which had fallen in the thunderstorm we had had overnight. 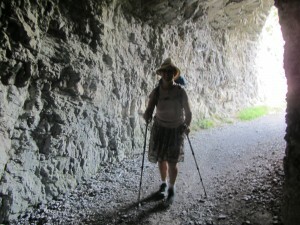 The path ran alongside the lake and alongside the road but inside a tunnel for about 1km, occasionally popping out for a breath of fresh air. 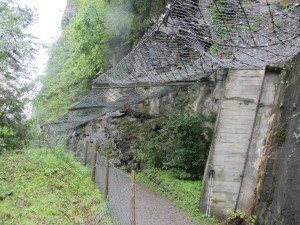 In the sections where it emerged into the air some nets had been thoughtfully provided in order to protect any rocks which might fall from injuring themselves. The rain started once again after we had emerged from the shelter of the tunnel but we followed the new policy of not putting on wet weather gear and carried blithely onwards. Up ahead of us on the path we could see a party of younger people with heavy rucksacks crawling along in the rain. By now we realised that the new policy was a dud but there was no shelter anywhere in which to take off the wet stuff and put on something dry, warm and waterproof. Hastening onwards with no sign of a shelter we could see Altdorf in the distance. It was then that we spotted a mining museum at the side of the road which had an inviting canopy. Having scuttled under this canopy we threw caution to the winds and changed into dry tee shirts. The museum helpers seemed amused by all of this and they also seemed amused by our project. 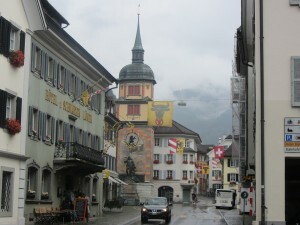 Altdorf looked very nice, even in the rain. We were expecting to see Willhelm Tell shooting an apple off his son’s head but we had obviously missed it. 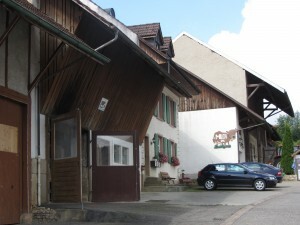 Tonight we are in a guest house above Altdorf in a village called Eggberge. No road up here just the cable car and some footpaths. At the moment there is a lot of low cloud outside so we are doing some paper work hoping that the clouds will lift and we can go for a romantic evening stroll later on. We spent last night in a guest house at the top of a cable car route. 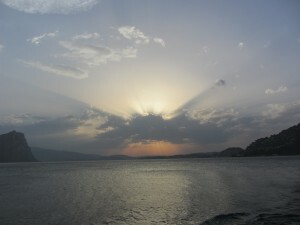 The stunning panorama remained just a dream for us as the clouds closed in and concealed that which lay below. Our breakfast this morning was plentiful and hearty and we ate plenty. 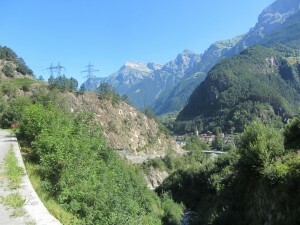 By the time we had stuffed our increasing belongings into our rucksacks and had an exploratory look around it was time to catch the cable car down and to continue our stroll. We were a bit flummoxed by the instructions inside the cable car and couldn’t see gow we could alert the bloke at the bottom that we were inside and ready to go. After the time of departure had passed by some minutes Janet got out of the car to look for someone who might know what was happening. I stuck my foot in the door of the gondola to avoid any possibility that I could be whisked to the bottom unaccompanied. Out of nowhere a klaxon sounded, Janet got back in, and we were treated to a fabulous view of the lake as we descended to the ground. 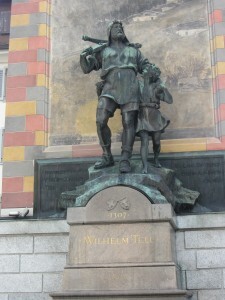 Making our way back to Altdorf, to start strolling once more, we spotted William Tell’s statue in the square. Tell’s son did not have an apple on his head but we filled in the gaps with our imagination. 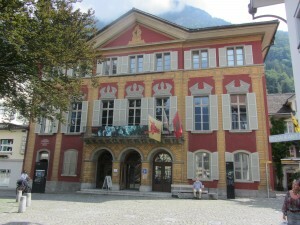 In September and October there will be a William Tell extravaganza in Altdorf, perhaps we should return. 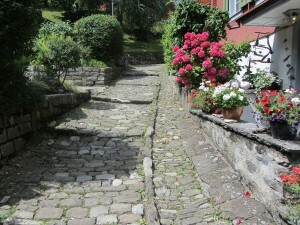 We wandered about Altdorf with the intention of finding the path towards St Gotthard. Sometimes we found it and sometimes we lost it. Our first false start took us into a chemical factory. In our defence I must say that the sign pointed in that direction and a picture of people walking was painted on the road. Luckily for us the security woman popped out of her cubicle in order to remedy our error. 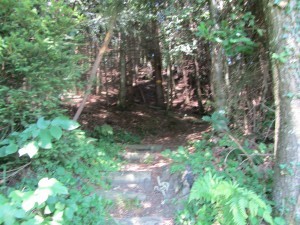 We did find the route again, although it had been modified by the construction of a new road and underpass. 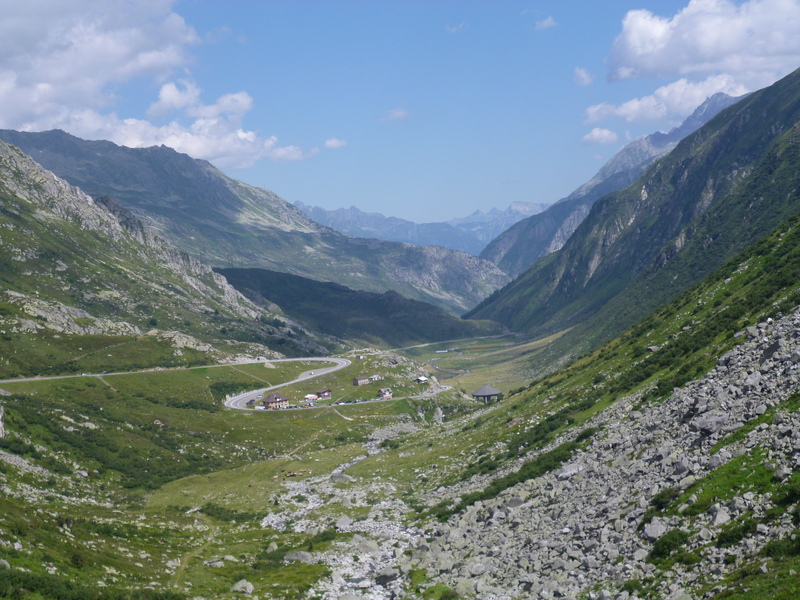 Once out of Altdorf we could see the valley ahead of us through which we will eventually cross into Ticino via the St Gotthard Pass. 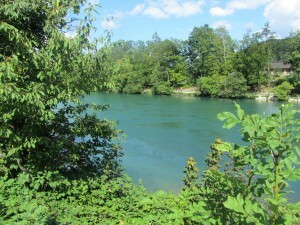 The river Reuss has been our companion today, helping us with our navigation. Part of the path went through the tunnel of the angels. People have left little models of cherubs and angels all over the place. They are stuck into crevices and onto ledges. I’m not too sure what this is about but it must mean something to someone. Tomorrow we are hoping to get to Amdermatt. This will be a challenge but, if we make it, then we shall have a go at going over the St Gotthard pass the following day. 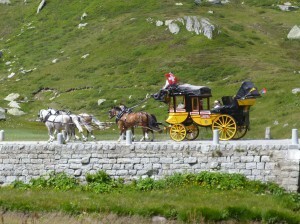 Tomorrow is National Day here in Switzerland. The Swiss have started to celebrate already by creating very loud bangs and playing some loud guitar music. Being a generous people the Swiss are sharing the bangs and music with us. 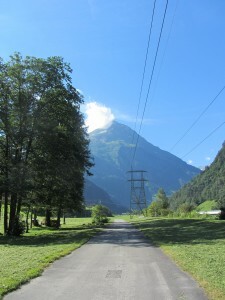 We were looking forward to today very much as it would take us nearer to our first Swiss mountain pass. Several times we have nearly taken the road over the pass in the car rather than take the tunnel, but have been prevented from doing so by a poorly car or by the weather. The weather today was perfect, warm and very clear enabling us to see for miles. We had no difficulty in finding the start of the path this morning and got underway easily. The valley is wide here with the mountains visible but not too near. It wasn’t long before the valley started to narrow. A motorway, a railway, an A type road, a big river, a cycle path and the footpath all move together up this valley. It was beginning to look as though our bit of the valley was getting smaller and smaller until we suddenly emerged onto a wide asphalt track. We were beginning to enjoy the spaciousness of this new surface and wondered how long it would last. We reckoned that today’s stroll would be about 14 miles long and that we should climb up to about 4,000 ft. It was about this part of the stroll that we realised that we had forgotten to add in a 6 mile section. We found ourselves strolling quite closely to the motorway at one point, indeed so closely that the path went inside the motorway services fence. For the most part the paths have been really well marked only once or twice have we found ourselves in any doubt as to which way we should go…. We are obviously much fitter than before as we didn’t really notice the steady climbs of today. It was quite a surprise to look back and see how far we had wandered. 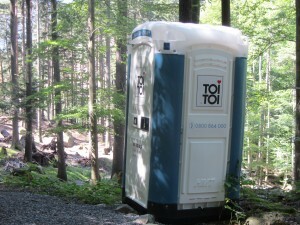 It was odd to find a public convenience perched on the side of the path. At last we had the place more or less to ourselves. We had said goodbye to the motorway and to the railway line. I have hundreds of photos of today as the scenery has been amazing and the temptation is to overdo bunging in what looks like the same photo, so I won’t. It is really useful that the footpath markers have times to destinations printed on them as one can then pace the day quite easily. The times shown on the markers are very generous and even when dawdling and taking photos and relaxing it is quite easy to arrive before the times given. This may not be true if the weather turns nasty of course but it was true for us today. 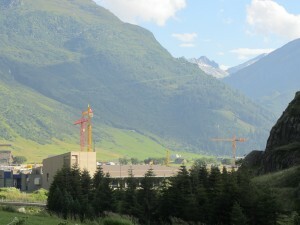 We turned a corner, went up a steepish bit and Andermatt suddenly appeared. It would be quite possible to have filled many pages with the account of today’s stroll but i feel about ready to switch off the cat and out our the light. 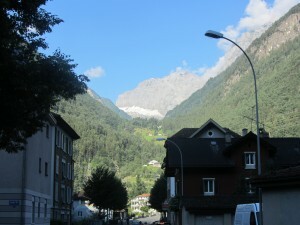 I think that today could be the best so far, but then, we have Andermatt to Airolo via the St Gotthard Pass tomorrow. Mike has troubles with his SatMap today, and so has delegated to me the task of writing the blog. A heavy responsibility rests upon my shoulders to live up to his standards and sense of humour. After yesterday’s glorious day of climbing up that valley, could today live up to expectations? 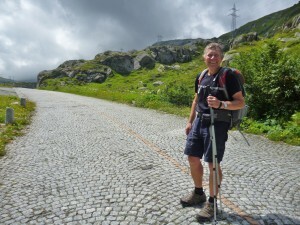 Another fine day, and we set off from Andermatt with every hope of achieving our aim of reaching the summit of the Gotthard Pass and descending to Airolo. 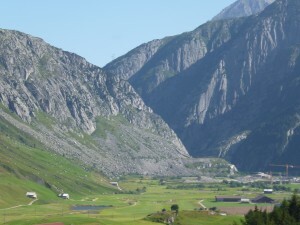 A quick look at Andermatt, the centre of which is very pretty, rather like a Swiss chocolate box, and off we set along the valley shown above. 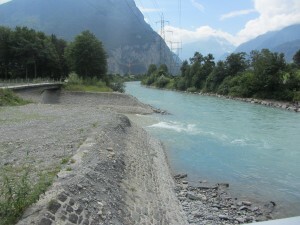 We followed the River Reuss in a fairly level way before we started climbing up up up. We did a lot of down as well as up in order to follow the path and keep out of the way of traffic, and then emerged below the main road into a high valley where the river gurgled, the flowers were in profusion, the cows rang their bells and looked contented with their calves, and we felt privileged (and also smug) that we were in amongst such beauty. 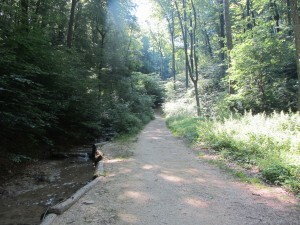 We had a spring in our step and were light of heart as we made our way across the ancient paths to our goal. Flowers have been a bit of a theme with our stroll, as we have seen spring arrive and pass, and summer is beginning to go over the top, but the flowers up here were stunning to see. There were flowers of different varieties everywhere. Just one example. In a comment, Royce had told us that she had heard that the way might be cobbled. We were delighted to see from time to time traces of ancient cobbles, and we felt as we had felt on the Ridgeway, that we were tracing the footsteps of history. As we climbed higher, we looked back at the valley we had just climbed, stunned by such beauty all around us, and the fine weather below. 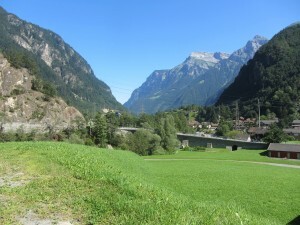 The wonderful valley, now below us, with the main road doing a bit of curving. In front of us, the weather looked rather threatening, but we laugh at such threats. As we climbed higher, we were guided across the main road where an alternate road to the pass started, which I think must have been the old road. And this road was also cobbled for most of the way, but cobbled with fine, modern cobbles. 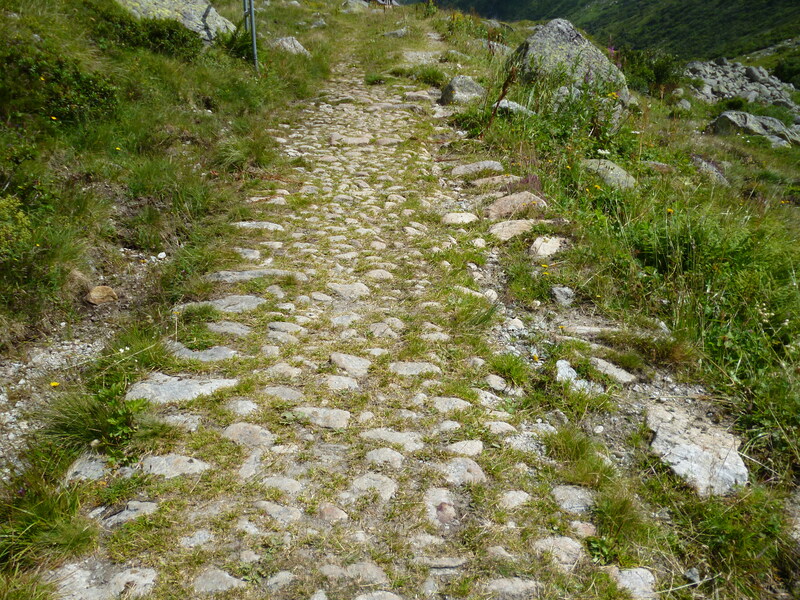 Fine modern cobbles that bikes, motorbikes and cars can travel on. We were only allowed on them occasionally. Not only modern vehicles were seen today. 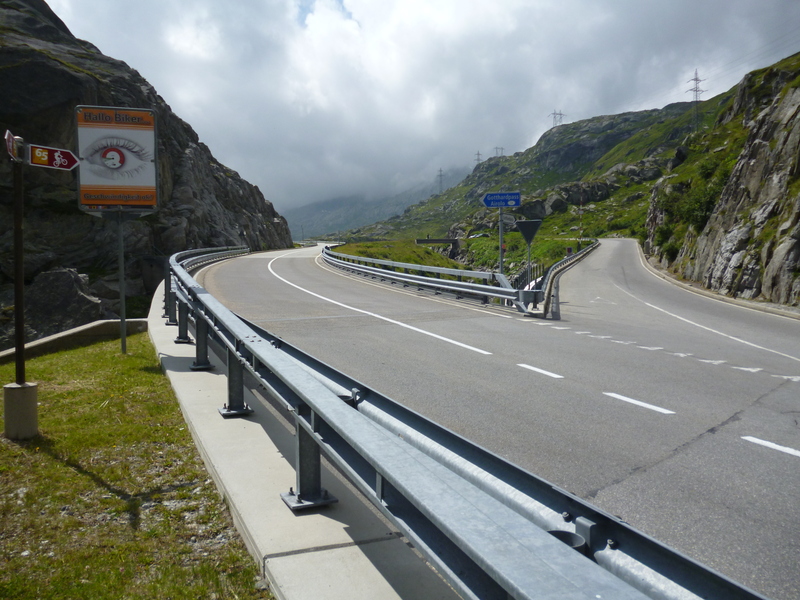 Today is the Swiss National day, and even at the top of the pass, we heard fireworks. We also heard loud jingling and a horn playing one of the Bishop’s Castle Drum and Bugle Band tunes. 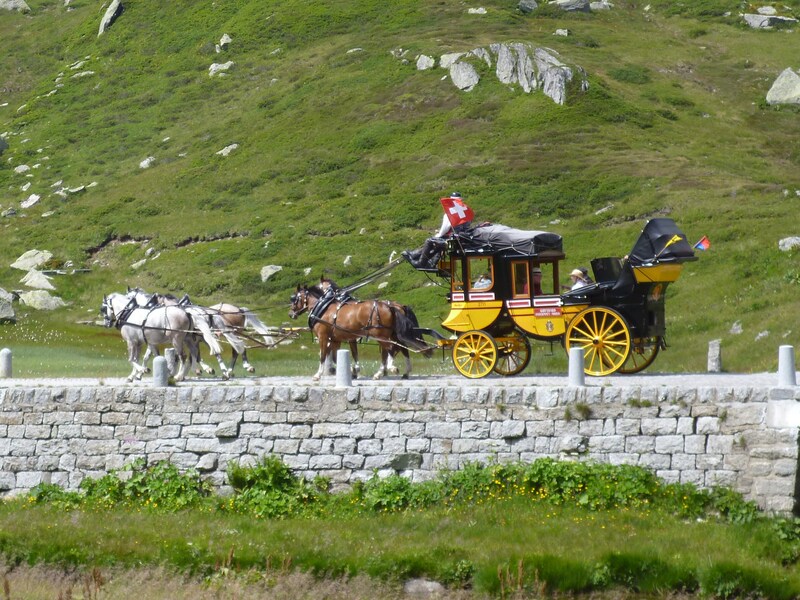 Two wonderful horse-drawn post carriages appeared, presumably for the national day. They were going right over the pass. There was a very long traffic jam behind them as they went up the main road before they went onto the old one. The amazing sight of a post coach. In the 19th Century, they went over the pass every day, I believe. We reached the top of the pass with no rain in time for lunch. We needed a bit of extra clothing on up there though, as the wind was no gentle zephyr. In fact, we got cold enough that when we went into an establishment for refreshment, we both had hot chocolate (even Mike). 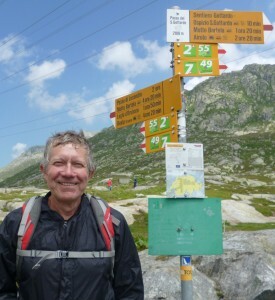 We were pleased to have reached the Italian speaking part of Switzerland. 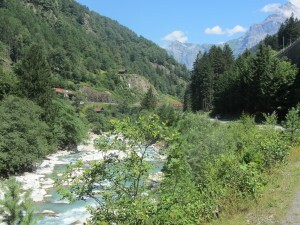 We passed into the Ticino from Uri not long before the top of the pass. 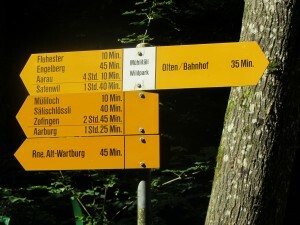 All the signs immediately were written in Italian, and we were no longer walking on Wanderweg, but Sentieri. 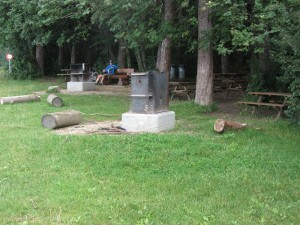 The summit was strange – hundreds of visitors, and not really very pretty or dramatic, so I won’t dwell on that. We started our descent by going into a farm-yard, but once we had corrected that, we managed pretty well, but the going was very steep – much steeper than the going up – and there was lots of down down down on very skimpy paths, occasionally joining the old road for short periods. 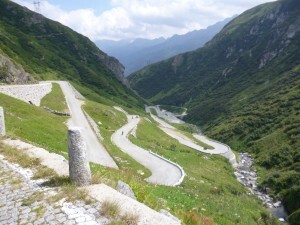 The view looking down at the road with all its twists and turns was very dramatic. It took us three hours or so to walk down, and our knees were beginning to feel slightly wobbly towards the end. Well, mine were, anyway. 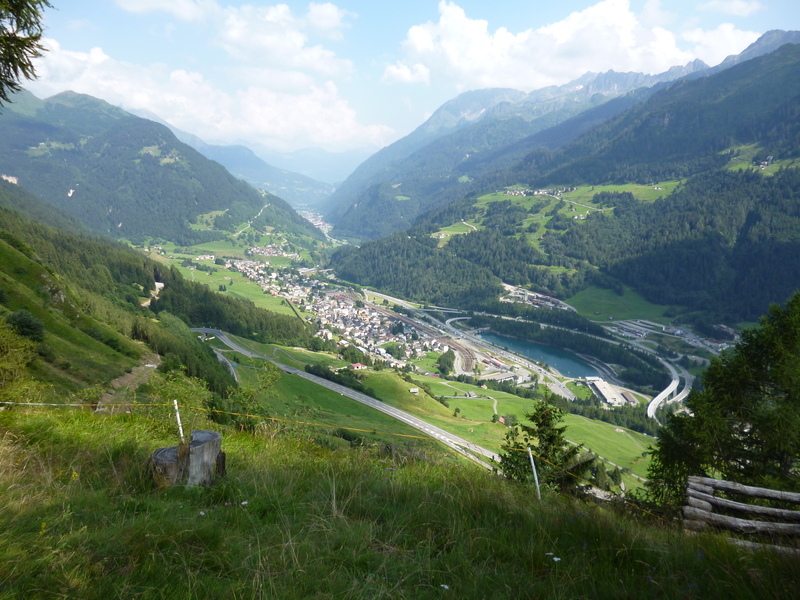 The view of Airolo and its valley about half way down looked very inviting, and we were pleased to arrive there and enjoy a beer. Could today live up to expectations after yesterday? It certainly could. And did.